The planning stage is nearly just as important as installing your chandelier. Not only does a chandelier have to suit your taste and the style of the room, it also has to be the right size. 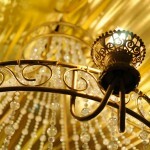 A chandelier that’s too small will be lost in the room and a chandelier that’s too big will appear bulky in the room. It is recommended that when choosing a chandelier, you make sure that it is at least 12 inches smaller than the table or countertop it will hang over. It should be hung approximately 48 inches from all the walls and 30 inches above the tabletop or countertop below it. 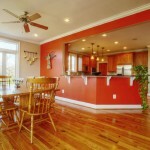 The first step is generally to mark the ceiling where you will install the chandelier. 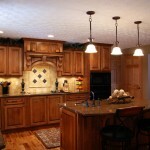 However, you don’t need to do this if you are replacing a light fixture you already have. All you have to do is use a tape measure to mark the spot where you will hang the fixture. You will need to cut a hole where the wires will go into the ceiling. For chandeliers that are over 40 pounds, you should put in a ceiling box to support the weight of the chandelier. If not, you can simply push the brace through the ceiling hole and place its feet on the ceiling. Then, remove the plugs for the electrical box that you will use. Hold it up to the roof and bring approximately six inches of the wire through the ceiling towards the cable connector. You can make sure the wire is secure by tightening the connecting screws. Install the accompanying electrical box. Now you’re ready to install the chandelier. Once you’ve drilled holes in the junction box, you can attach the chandelier using the mounting bracket. Mark the wires at the length that you would like to hang the chandelier, so that it’s approximately 30 inches above a tabletop or counter. You will have to pry open the top loop of the chain with a pair of pliers and connect it with the upper loop of the chandelier. Use the pliers to close both loops again. Remove any superfluous chain. Thread the cords through the links of the chain so that they are taut. Finally, you have to connect the cords to the wires. Wrap the grounding wire around a grounding screw, making sure that it is tight. Then connect it to the accompanying ground wire. Remove approximately a half an inch of the coating from the chandelier wire. Connect the wire that is white to the matching white wire from the box. Do the same for the black cable wires. Next, feed the wires through the junction box and place the retaining collar at the ceiling entrance, making sure that it is tight. Flip on the light switch and you’re finished.